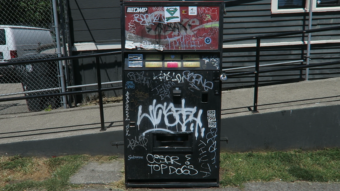 In the city of Seattle, Washington there exists a vending machine that over the years has become something of a local landmark amongst residents who are familiar with its mysterious history. Situated on the corner the John Street and 10th Avenue East in the bustling Capitol Hill neighbourhood, the seemingly ancient machine is well known for dispensing random, sometimes rare, cans of soda- a fact that’s made all the more intriguing when you consider that nobody seems to know who stocks the machine or where it came from. Covered in Coca Cola livery and a smattering of graffiti, the machine’s most notable feature, other than its age, is the fact that there’s no option to order a specific drink from it. Instead, after putting the requisite amount of change into the machine, you are given the option of pressing one of six buttons, each of which sports an apparently custom-made (and heavily faded) label that simply reads “?MYSTERY”. Pressing one of these buttons will then cause the machine to spit out a random can of soda. Exactly how many different kinds of soda are stored inside of the machine at any one time isn’t known and there are reports of people dropping tens of dollars into it at once in an attempt to discern what, if any, pattern there is to the kinds of soda dispensed. The result is invariably the person walking away with dozens of cans of weird tasting soda, but no answer. What makes the whole thing weirder is that a a small percentage of the sodas the machine dispenses are incredibly rare, if not otherwise impossible to acquire via conventional means due to them being discontinued or only available for sale outside the United States. For example, people using the machine are known to have walked away with cans of soda that haven’t existed or been popular since the 1980s, like Lemon-Lime Slice and Pepsi AM, or obscure drinks like Diet Hubba Bubba Bubblegum Soda and even bacon infused Coca Cola… There are even rumors that people have gotten cans of New Coke and Crystal Pepsi from the machine. As if this alone wasn’t unusual enough, the machine has also been known to sometimes spit out otherwise normal brands of soda, but with the cans sporting vintage livery that hasn’t been used in decades. To date the only real common thread between the cans dispensed by the machine anyone has noticed is that it only ever seems to contain brand-name soda produced by either Coca Cola or Pepsi. Curiously, despite being targeted by countless vandals and irate customers over the years (the machine has a propensity to eat bills particularly, but also sometimes change), Seattle residents familiar with it note it’s almost never out of service and report that any time the machine is damaged, it is generally fixed within a day or so. It’s similarly reported that after the machine was broken into one time it was restocked and working before the week was out. It was then modified so that it was anchored to a nearby wall with a heavy padlock attached to protect the sweet syrupy nectar housed within. That said, when the staff here at TodayIFoundOut went to go check out the machine a few weeks back in June of 2018, while many people were still attempting to use the machine, including ourselves, it wouldn’t dispense any soda, though happily collected people’s money. We could also hear the compressor working to keep the sugar water inside cold, so it wasn’t completely broken. Presumably this all means the machine is in for repair and to remove the many layers of graffiti currently adorning it. Bizarrely, despite all of this and the fact the machine is evidently being restocked on a fairly consistent basis given how frequently it is typically used because of its tourist attraction status, it’s unclear who actually owns and operates it. A common hypothesis is that the machine is owned and operated by the owners of Broadway Locksmith, which the machine is housed immediately outside of. Supporting this idea is the fact that the machine draws power from Broadway Locksmith and that the heavy padlock keeping it secure was seemingly bought from there. However, if Broadway Locksmith is responsible for stocking the machine, they have made a commendable effort to convince people otherwise. In addition to flatly denying that they have anything to do with it, both the owner of Broadway Locksmith and random employees have stuck to the exact same story over the years while being grilled by everyone from USA Today to Vice. They claim they don’t know who restocks the machine and that they’ve never seen anyone open it up to put something inside or collect the money it contains. They do, however, claim the machine has been there for a couple decades, which is more or less corroborated by local residents, give or take a few years depending on who you talk to. Now, at this point you may have found yourself thinking, “Okay, but surely the city knows who owns the machine because whoever owns it must have a permit or something, right?” Well, Jessica Lee of The Seattle Times had that exact same thought and reached out to city officials about the matter in an attempt to discern once and for all who actually owned the machine. According to Lee, a spokeswoman for the city eventually got back to her and explained that, for some reason, the city didn’t have any records pertaining to the machine in question. But for now, despite all the hoopla about it and the surprisingly popular tourist attraction it has become, there exists a more mundane explanation. While most locals living nearby likewise report never seeing anyone stocking the machine, a few have come out and stated they’ve seen an unmarked white van pull up in the middle of the night with the driver stocking it. Twitter user Sarah Hamilton (@saeofdoom) even once managed to snap a picture of a man and a woman stocking the machine in broad daylight… Sadly, ET was nowhere in sight at the time. But even with that picture, nobody has yet identified the couple shown. Do Vending Machines Really Kill More People Than Sharks? Every place should have one. I’m pretty sure this is the American counterpart to SCP-261 because it takes dollars and not yen. It seems eerily similar. As usual a great post. Thank you. Wow, that’s really impressive that no one has seen it being repair or restocked (or even removed!). That’s so odd. How is that possible. Very neat though! You’ve never seen a pay-phone emptied either. Some stuff is weird like that…. So I moved to Seattle in 2003 a few blocks from the machines location and it was there and a pretty old machine back then. I passed by it almost daily tho I gave up feeding it money after the first 3 times it didn’t work. I never once saw it being restocked but I was once told that it belonged to someone who previously owned a business in the nearby vicinity and after his shop closed he kept servicing the machine. Who knows if that’s true tho. BTW if I’m remembering right, the labels use to be for regular sodas with only the last a hand written “mystery” label. I only ever tried for A&W root beer. Actually that was Mug root beer. My bad.